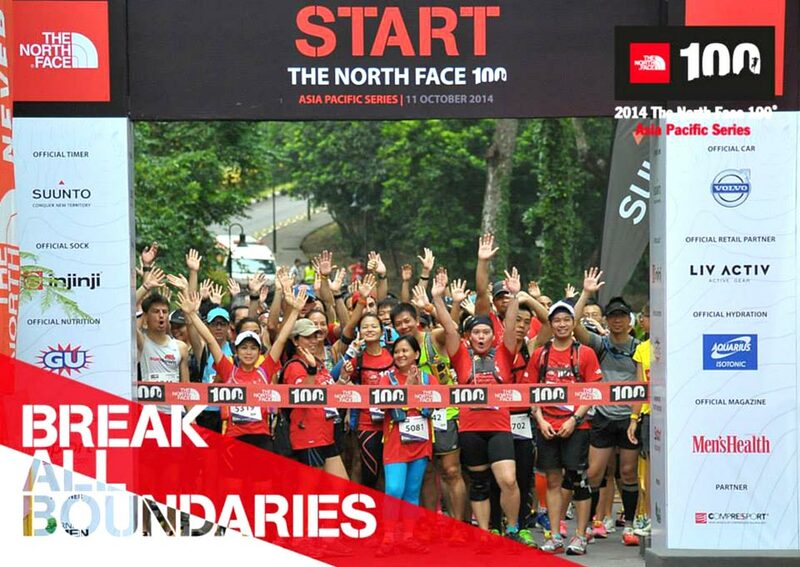 The 7th edition of TNF100 Singapore this year attracted 3,200 nature-loving adventurers last Saturday morning. 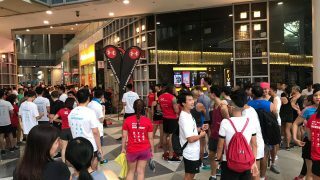 With overseas participants making up 39% of the race, trail runners from all around the world gathered here, laced their trail shoes, filled up their hydration belts, and were ready to tackle the trails of the Lion City! Getting Ready for the Epic Trails! After completing the 50km for the first time in 2013, this year's pre-race build up seemed somewhat subdued, with little in the way of announcements and pre run communications that I would expect from the international series of events that includes the famous Ultra-Trail du Mont Blanc. Rocking up on race day, whilst I was appreciative of the sleep-in (50km started at 7am this year compared to 5am last year), I was just a tad nervous about how I would cope with a post dawn start time, longer exposure in the daytime sun, the ever-looming haze and of course the epic 50km of undulating terrain ahead of me. After passing through the obligatory bag and kit checks, I mingled alongside fellow trail runners at the 50km start line, a colourful mix of aspiring first timers and seasoned racers (some of which had amazingly completed ultras just a couple of weeks earlier!). Flag off was timely and without a hitch. No unnecessary jostling at the start; everyone knew this was a run to respect, right from the get-go! The 50km route meandered around MacRitchie Reservoir, followed a rather narrow path along Rifle Range and onto the green corridor at Bukit Timah Road and around Dairy Farm, and then hugged the gravel tracks to Mandai Road, the furthest point away. After the turnaround here, it was straight back down and around the other side of MacRitchie Reservoir. Although billed as a trail run the terrain was pretty kind on the feet and the lack of recent rain meant thankfully little chances of muddy puddles to jump over. The main hazards along the route appeared to be the ever-inquisitive monkeys who were not shy to approach the unsuspecting runner. 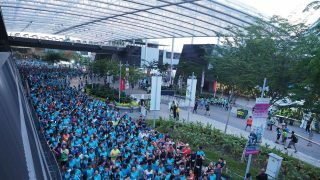 As with any race in Singapore, hydration was key, and running with the compulsory 1.5L fluids ensured that participants had ample supplies. And, if you were running low, top-ups of water were provided at the checkpoints alongside cups of isotonic drinks. Bananas and gels were also supplied at selected pit stops. The route was relatively quiet, and it was perfect to zone out, relax into a rhythm and appreciate the nature around me. 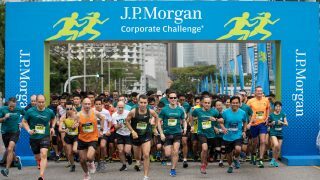 The crunch point came as all 4 races merged just as we all climbed the ascent to Check Point 5 outside the Singapore Island Country Club. On the whole however, participants were accommodating to each other, allowing passing where necessary. Improvements could be made at the checkpoints with volunteers having more knowledge of the current distance or having distance markers and maps clearly displayed. This might seem a minor point, but when you're not sure where you are and pretty fatigued (too tired to pull my map out of my backpack) it's good to know how far you have left to go. 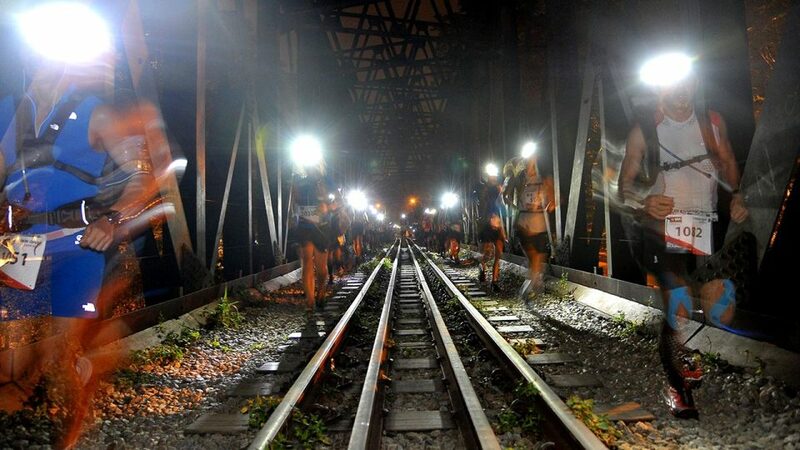 The route was generally well-distributed with signs, although some 100km participants noted that there was confusion around which way to go at the Mandai checkpoint. Defending Champion Vlad Ixel Shaves 35 Minutes off Previous Time! This year, 27 year-old Australian Vlad Ixel came in Champion at the 100km Open Category for the second time in a row. He finished in an astonishing 9 hours 35 minute and 46 seconds, shaving nearly 35 minutes off his finish time in 2013. The fastest Singaporean this race, Wong Hoong Wei, finished the 100km race in the third position with a time of 10 hours 46 minutes and 56 seconds. Hoong Wei took part in the TNF100 Beijing earlier in May this year, coming in 45th out of more than 300 international runners in the race which he called "one of the toughest" he ever ran. Compared to last year, the finishing area was a let-down. 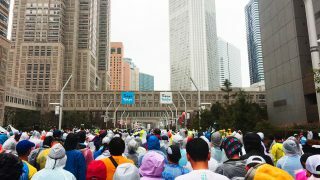 Perhaps it was simply bad luck when I finished, but the last thing I wanted to do after completing 50km was run into a queue for 10 minutes for refreshments and food. Despite this, the selection was generous with all categories receiving sandwich, drink, fruit, and ice cream. No massage this year was also a big disappointment! Other improvements would be the 100km finishing with the other categories rather than at Hindhede Walk, which was a bus ride away. 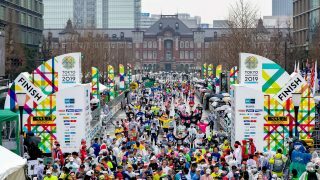 It was a shame that we were not able to see the 100km runners complete what is a remarkable feat and cheer them on at the end. 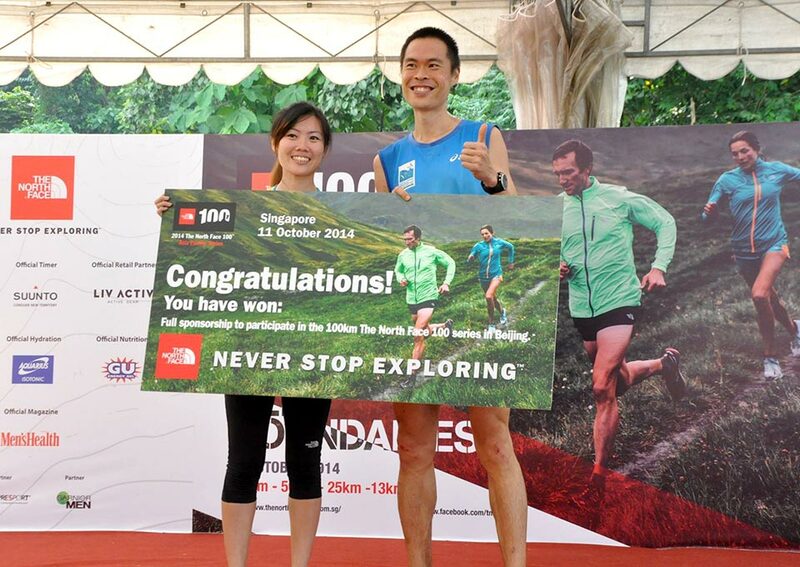 Mervyn Chew, a veteran of many Singaporean ultramarathon events, took part also in his second 50km event at TNF100. "This year I revisited the 50km category again as I think I could still improve from my time of 6 hours 4 minutes last year. I did improve by 20 minutes this time, walking the upslopes and running the flats and downslopes." 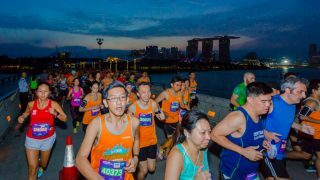 "It would be great to have more interesting landscapes to tackle, but given Singapore's terrain and size, there isn’t much land for the organisers to play around with." 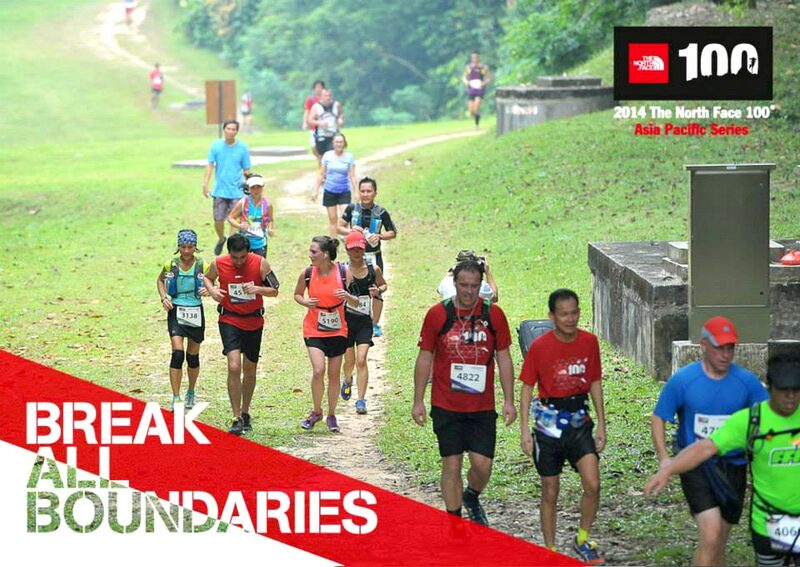 The North Face 100 Singapore was on the whole, easy to navigate, displayed a great spirit of camaraderie amongst participants and a route that showcased some the most beautiful green areas of the Singapore heartlands. Improvements in pre-run communications and after-race logistics would have turned this race even greater for me. All in all, I’m excited for next year! Wonderful race atmosphere, with race route showcasing some of Singapore's natural greenery. Great spirit of camaraderie amongst race participants. Compulsory hydration ensured that runners had fluids with them at all times, reducing potential problems.